Years of reliable, efficient service throughout the world have earned the Model 2452 flaking mill a reputation as one of the top flaking mills in the industry. Its stablemates, the Model 3162 and newest Model 3180 flaking mill (pictured), offers processors greater capacity without the pitfalls of many other high-capacity flaking mills. Damaging vibration and roll deflection, potential problems as roll size increases, are minimized in the larger models through precision design and engineering. The sturdy construction and smooth operation of French flaking mills insure stable process results. To download a Flaking Mill brochure please visit our product literature page. Rigid sliding bearing blocks mounted on precision machined keyways and a one-piece, cast iron base minimize vibration, maximize roll life and help maintain precise roll alignment. Combined, these features reduce downtime and maintenance costs, lowering the lifecycle cost of the mill. 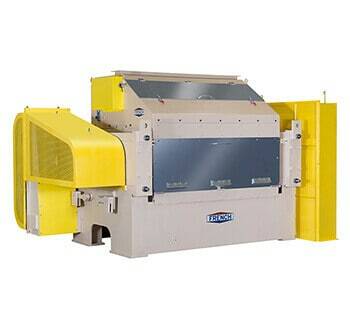 Please contact our Oilseed Group for more information or to request a quote for a French Flaking Mill. Our Aftermarket sales department provides parts for our existing flaking mill models as well as your older models, such as the 2042 and 3042.